PRESS — Flotsam & Co.
We had the privilege of being hilighted as a premier local artist and vendor in Japan’s “Hawaii Style” Magazine. Featured are our exclusive 24kt and copper electroplated items, which are signature pieces to Flotsam & Co, found nowhere else! A few of our favorites made it into What’s Up Hawaii! Sunset Magazine-- We've made the "Bucket List"
We've been spotted in Sunset Magazine! @sunset_magazine . Mahalo for the feature!! 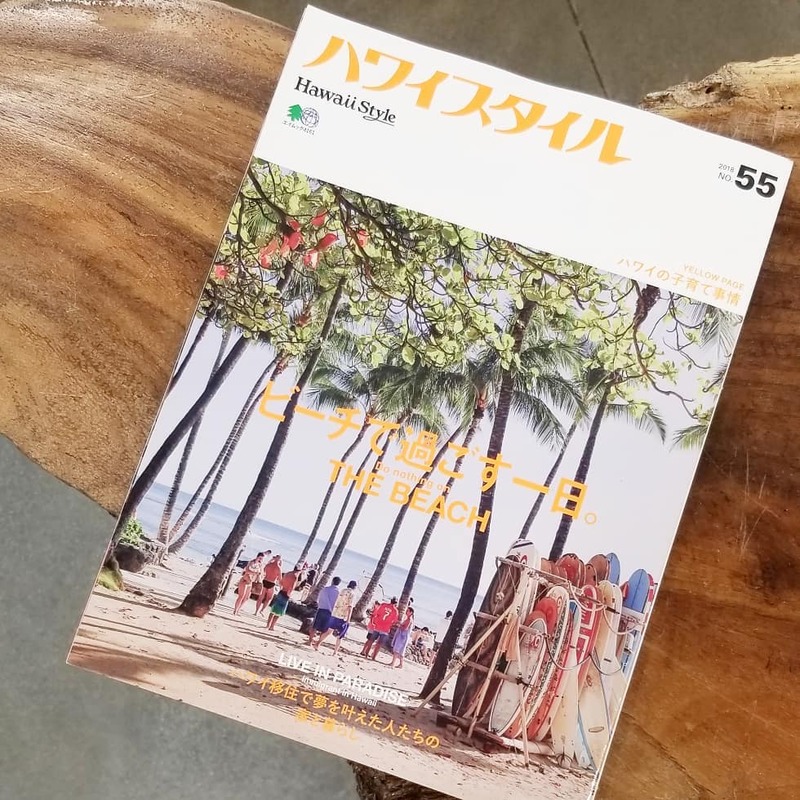 Japanese Magazine "Luxury Hawaii" Features Flotsam & Co.
We are pleased to be feature on one of Hawaii's most prestigious Japanese magazines, Luxury Hawaii, as an exclusive retail hilight on the island of Oahu. The magazine spent an afternoon with us, learning about how we source our shells, and seeing behind the scene aspects of handcrafted jewelry making. A big Mahalo to Ward Village for the feature! "Karen Sawicki isn't your typical entrepreneur. As the owner and founder of FLotsam & Co., a hip boutique with a focus on locally made jewelry, Sawicki sources many of the shells she uses in her designs by free diving up to 100 feet, scouring the sea floor for the perfect shell. The result, as you'll see in her Ward Warehouse boutique, is a line of jewelry that's unlike anything you'll find anywhere else." Pacific Business News reports on new South Shore Market and merchants of this exclusive retail & shopping location at the Ward Village. "The 11 tenants confirmed for the market include Big Island Delights; Big Bad Wolf, a children's retailer; Cameron Hawaii, a beach resort lifestyle brand; Coffee Bean & Tea Leaf; Eden in Love; Flotsam & Co., a jewelry retailer; Holoholo Market; Kealopiko, a clothing retailer; Manaola, a boutique; Mori by Art + Flea; and Salvage Public, a menswear retailer." Honolulu Magazine's Top 5 Stylish Picks! Art + Flea Success Stories: Flotsam & Co. So many thanks to Aly of Mori/Art & Flea, Pete, Makoto and Rise for this beautiful video. I have to give a wholehearted thank you to Art and Flea. Without being involved in their urban marketplace for upcoming designers, Flotsam & Co. would have never organically expanded to where it is today. Flotsam & Co. looks forward to participating in more A+F events! Stay tuned on our "events" page for the latest news! Featured by S.Life as Top 10 shopping destinations in Hawaii! Aloha Street Japanese Magazine x Flotsam & Co.
Aloha Street's main homepage featuring our Flotsam & Co. handwritten typography. Thank you for the mention! Mahalo! In light of International Women's Day, it was an honor to be hilighted by Ward Village's blog as a female entrepreneur! "...One of Ward’s latest retail additions, Flotsam and Co., opened their doors in Ward Warehouse just last week. The store’s founder, Karen Sawicki, carries an eclectic collection of jewelry and other inspiring items that reflect her passion for design and diving. In fact, many of her pieces she stocks in her charming space are composed of shells she finds while diving. When the opportunity arose to manifest her passion into her own brick and mortar store, Sawicki dove right in. The result was an awe-inspiring feeling that she’ll carry with her forever. "For the full article click here! MY ONLY HAWAII-- a Japanese travel guide exploring the fashion, food & culture of Honolulu stopped by the storefront for a visit! Ward Warehouse welcomes “Flotsam & Co.” a new jewelry boutique that incorporates beautiful shells into wonderful ocean inspired designs “Flotsam & Co.” owner and designer Karen; is one of the divers that find the shells and materials. Sunrise shells are one of the most scarce sea shells as they only live in the waters around Hawaii and are very difficult to find.Sunrise shell jewelry have recently becoming increasingly popular in island jewelry as they are a great way to represent the beauty of Hawaii to the world. This boutique has many selections in size, design and price. You may also find a beautiful moon light shell which is has beautiful light and dark hues. As you can see in the video below, Karen's deep passion for her jewelry is evident in the extreme lengths she goes to procure the most beautiful shells and the beautiful designs she uses to compliment them, making flotsam jewelry true treasures of the islands. Be sure to try your luck at the 25 cent jewelry capsule machine, If you’re lucky, you can get a mini sunrise shell! We recently met with Natalie Schack of Honolulu Magazine's fashion &a lifestyle blog "Lei Chic." Her beautifully written article captures the essence of our new brick and mortar storefront. 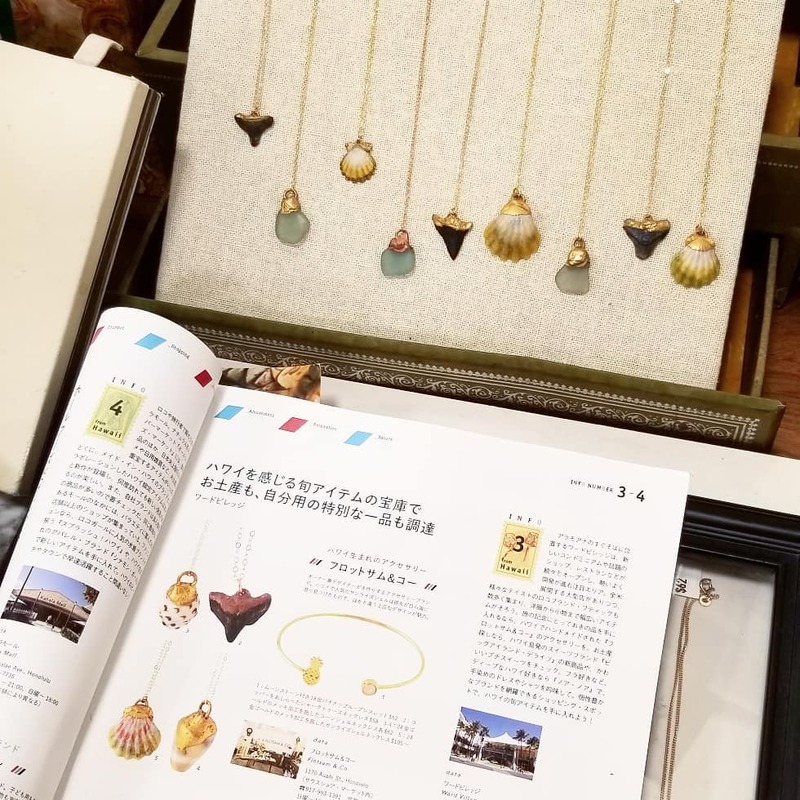 Had the pleasure to meet Kei Yasuma and talk to her about Flotsam & Co. We were thriled to be featured in her article for "Aloha Street" one of Honolulu's premier Japanese Magazines. Full article is available HERE ! Our apothecary products including men's grooming featured at Mori Hawaii. Mori by Art + Flea has goods made by local artists. The artists change every three months so that you could see variety of exciting items. You will enjoy cosmetics for men and women, jewelries, apparels, arts, instruments, and more items at the store. Flotsam & Co. was pleased to be part of the kick off block party for POW WOW Hawaii and Honolulu Night Market. February’s night market kicked off festivities for one of the most anticipated art events worldwide, Pow! Wow! Hawaii, adding a fresh, artistic energy to the all-ages Our Kakaako block party, with artists from Honolulu and beyond live painting and drawing throughout the event. We had such a great time meeting everyone at the Night Market and were honored to be part of the artists showcased at the event! Check our Events calendar for more upcoming pop ups! 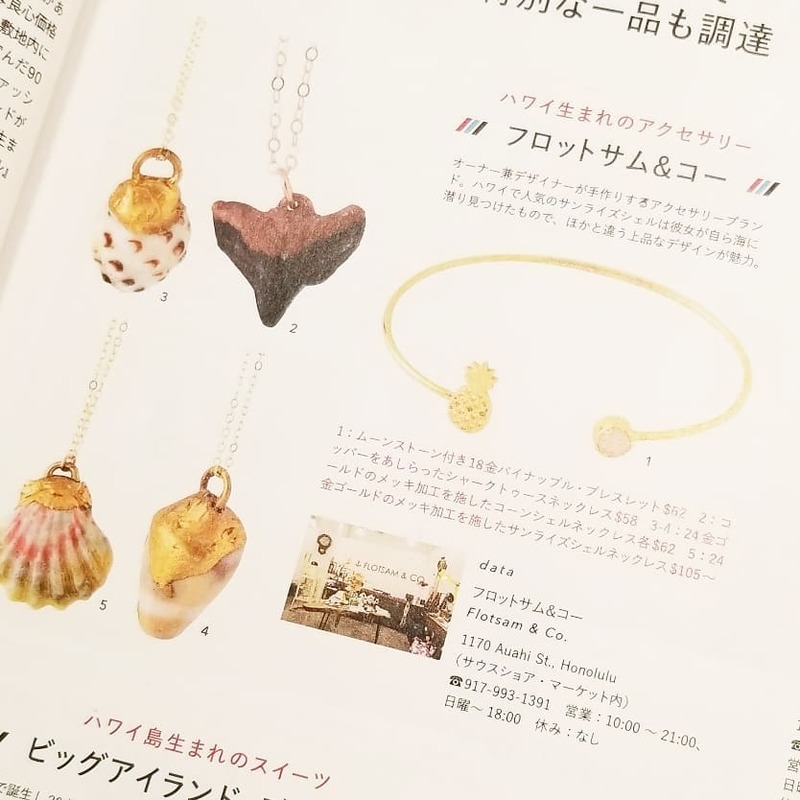 JAPAN AIRLINES & JAL CREDIT CARD FEATURES FLOTSAM & CO. Many Mahalos to JAL credit card & Tokyo Broadcasting for doing an entire TV show program on Flotsam & Co. My passion for diving, our Made in Hawaii products and my personal creative process. So appreciative of all the support! Flotsam & Co. products featured in Mori Hawaii's 2015 Holiday Gift Guide. Flotsam & Co. was honored to be a part of a unique event which showcased local Hawaiian artists and vendors in a pop up general store hosted by Kinsfolk Brooklyn. From September 10 to 17, hundreds of people stopped by the FLUX Hawaii General Store, curated in collaboration with Mori by Art + Flea, to shop wares from nearly 40 vendors Hawai‘i’s modern and diverse culture at Kinfolk 90 in Brooklyn, New York. The pop-up shop will represent Hawaii’s modern and diverse culture to the global audience present in New York during Fashion Week and will offer iconic Hawaii products for sale from nearly 40 local artisans including Flotsam & Co. The shop kicked off with a performance by Big Wave Tour champion Makua Rothman and Thomson Enos of Typical Hawaiians.